With Macy's shares slumping this year, Amazon should take a look at buying the bricks-and-mortar retailer. If opposites attract then maybe dominating online retailer Amazon (AMZN - Get Report) should link up with struggling traditional retailer Macy's (M - Get Report) . At least that's what a number of influential investors and analysts are saying right now. "I think it absolutely could happen," Amplify ETFs CEO Christian Magoon told TheStreet. While Amazon just gained a chunk of physical locations in the U.S. with its acquisition of high-end grocer Whole Foods (WFM , it's still going to need more physical spaces to further improve its already impressive delivery speeds, Magoon pointed out. Whole Foods has 466 locations in North America and the United Kingdom. Macy's has 700 department stores and 125 specialty stores. Amazon would take Macy's in a new direction, he said. 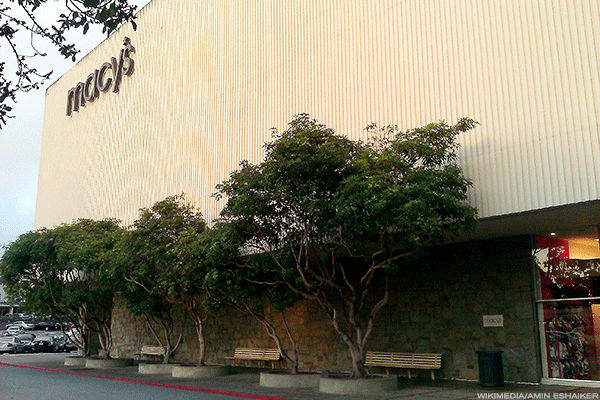 Macy's used its stores mainly as a showroom and secondarily as a place to stock inventory. But Amazon could use the locations for a number of purposes, including drop-off locations for drone deliveries. In addition, Amazon will need physical spaces to host its version of Best Buy's (BBY - Get Report) Geek Squad, or a gadget repair service that Recode reported Amazon is currently working on based on job notices for IT professionals. The two companies coming together would be slightly awkward considering Amazon is the main reason Macy's stores are dying, TheStreet's founder Jim Cramer noted said recently on CNBC's Mad Money. "Ever since the Whole Foods deal, we've heard repeatedly that Amazon might buy any brick-and-mortar company that can help them dominate, including the likes of Macy's," Cramer said. "That'd be an interesting situation: Amazon knocks down a stock with its own power and then gobbles up the stock underneath when it suits them." The combo first popped up earlier this year after Macy's announced in January that it would be shuttering 68 stores by early spring and letting 3,900 employees go as it transitions into a more digital-friendly store. The following month Cowen & Co. analyst Oliver Chen said the merger would be smart because Amazon could use the Macy's locations as part of its distribution network to improve delivery speeds. In addition, Amazon would absorb some well-known clothing brands and could use logistics and big data to help Macy's with inventory decisions. Macy's could use Amazon's help. Amazon's revenue came in at $136 billion last year and could easily scoop up Macy's for $10 billion, a valuation set by Cowen & Co. analyst John Blackledge in a note to investors. While Amazon hasn't had a history of doing bigger deals like this, the $13.7 billion Whole Foods deal could be the start of a new M&A strategy from Amazon. While Macy's investors might get some relief if Amazon buys the store, Cramer warned to not buy a company's shares just because it might get acquired. This is especially important if a company has weak fundamentals, like Macy's, he noted. Whole Foods CEO John Mackey made about $8 million off of the Amazon deal, while Amazon CEO Jeff Bezos made about $1.88 billion. Magoon noted that while Amazon needs more bricks-and-mortar locations, Macy's might not be its best option because the company is big enough that it can probably "gobble up" some surviving retailers. In addition, since the majority of Amazon Prime members make more than $100,000 per year, a higher end retailer like Nordstrom might make more sense for it, he said. Another option would be for Amazon to go after the lower demographic that it's not currently reaching by purchasing the Dollar General (DG - Get Report) , which has over 13,000 locations. Whole Foods was a smart purchase for Amazon because the cheapest means of delivering a product is having customers come into a store to pick it up themselves, Tigress Financial Partners CIO Ivan Feinseth said. By expanding its physical store presence, Amazon can get things to consumers in a cheaper way, either by allowing them to shop in the stores or to pick up online orders in stores. Amazon could do the same thing with Macy's stores, he noted. "Amazon is just everywhere and it's not going to stop," he said.